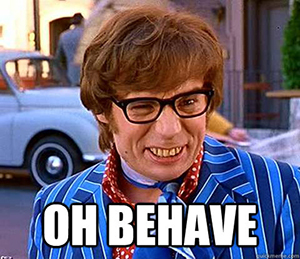 Quotes of the day: oh, behave! Always behave as though others were watching. A man who looks after his actions sees that others see him, or will. He knows that walls have ears, and that what is badly done is bursting to become known. Always behave like a duck. Keep calm and unruffled at the surface but paddle like the devil underneath. If people behaved like governments, you'd call the cops. If you don't behave as you believe, you will end by believing as you behave. If you're born with a gift, to behave like it's an achievement is not right. It is usually when men are at their most religious that they behave with the least sense and the greatest cruelty. It's good to know that if I behave strangely society will take full responsibility for me. Men and nations behave wisely when they have exhausted all other resources. The less I behave like Whistler's mother the night before, the more I look like her the morning after. You can't talk your way out of something you behaved your way into. You have to behave your way out of it. A configuration problem rendered the quotations system inoperable for the past day or so. It's been corrected. Sorry for the inconvenience.